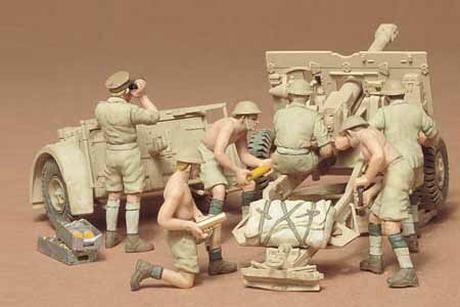 1/35 scale assembly kit of the British 25-pdr. Field Gun. The were the primary field artillery pieces used by the British army and Commonwealth forces from WWII until after the Korean War. Special Feature 1 The gun carriage can be assembled in either deployed or traveling position. Special Feature 2 Wheeled trailer to link the gun with tractor included. Special Feature 3 Set includes total of 6 figures conducting firing operation in North African desert. Special Feature 4 Ideal for pairing with Item 35045 Quad Gun Tractor.